#1. What are Sneakers ? Sneakers (also known as athletic shoes, tennis shoes, gym shoes, sport shoes, runners, or trainers) are shoes primarily designed for sports or other forms of physical exercise, but which are now also widely used for everyday wear. The term generally describes a type of footwear with a flexible sole made of rubber or synthetic material and an upper part made of either leather or synthetic materials. as the definition giving brief information but we’ll go into the detailed info. #2. Types of Sneaker shoes. 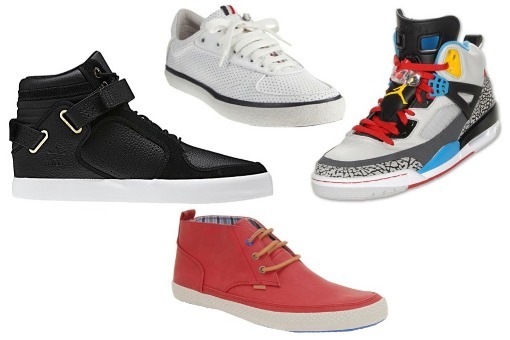 In High Tops, there are again three categories, thin high sneakers , mid high sneakers and High neck top sneakers. The Thin high sneakers can be wear on a shirt and blue jeans do not in-shirt, it will look awkward. you can wear this category of sneakers with T-shirts also. make you wear nice colored which will be look good. The mid high sneakers can be wear with T shirts with Jacket on , if you want wear it on Normal casual shirt its better to leave the buttons off. among all types these look best in all kinds of style outfits. The high top sneakers are generally very high to the ankles, the high tops are wear only when suitable jacket is on. These Low top sneakers can we wear with all kinds of styling. These look best for casual look, suited look , work look and informal look. in this white and black sneakers are so popular, you can wear it wit any kind of casual look. In this category , the leather shoes and Normal casual shoes will come under this category . This can wear with formal look and casual look also. The formal look can be Suit look or it can be normal Shirt with Non-jeans trousers , these mid cut sneakers available in wide range of colors and patterns can be wear on Casual look also. Do not think these category like woodland boots, these are different category in Sneakers. these can also paired with any king of outfit but when the Jacket is on or leaving the shirt buttons these will look better. Now a day these sneakers are called as loafers, these don’t have laces and can be paired with casual outfits. Loafers can be worn with a range of outfits, and both casual and formal looks can easily be achieved with one versatile set. A good pair of black leather penny loafers can easily be worn with a simple pair of black skinny jeans and a simple t-shirt, but also a formal tailored suit and tie. If you’re looking for a pair of loafers that steers more towards the casual look, pick one in a less intense, but equally versatile, brown colour rather than black. You can easily dress these down with some denim jeans or navy chinos to give a laid back look that’s easy to mix with a variety of tops. In general it’s best to keep your leg wear slim fit to ensure that your loafers don’t get drown out by materials, but with everything from chinos to shorts going with these classic shoes, there’s no reason that loafers can’t become a staple part of your wardrobe. These will be look alike of high top or low top sneakers but there is small difference of circuital top in this category. These can be worn with jacket or leaving the shirt open, these can be wear it for party and casual outfit who need craziness they can adopt these category in their wardrobe. In conclusion, there are plenty of ways to style dress sneakers effectively if you have any styling suggestion or any doubt please comment below.